Global settings are the formatting elements that you set once, at the start of formatting your book. Examples of these are page size, margins, headline styles, etc. Depending on the type of book you have, these settings may be the only settings you need. Sometimes, with a non-fiction book, you may have once-off items, for example, a sidebar set in one of Word’s textbox options. These will be covered later. Create a folder on your hard drive (your desktop may be a good idea, then there’s no risk of not being able to find it later). You will save your example book design here, to use for all future posts. Open Word. A new blank document should be open in Word. If you don’t have a blank document available in Word, create a new document by clicking the Office button , then click New. 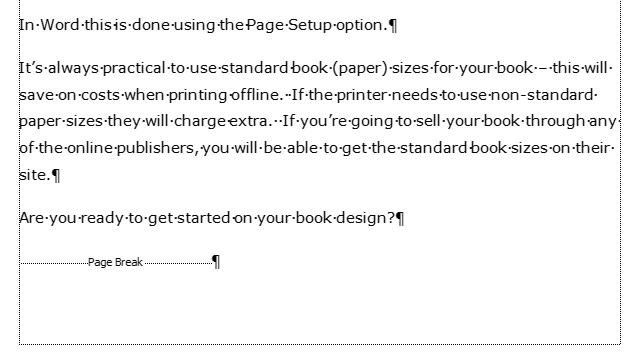 NOTE: Usually the Blank Document template will be available by default, and this is what we’ll be using for your book. Click the Create button on the New Document window. Word 2010: Click the File tab, then click New. Click the Create button to open a new document. Using your completed Book Design Checklist (you have done your Checklist, right? ), you start with the global settings of your book – this will save time (and frustration) as you continue with the design. It’s a good idea to work in the Print Layout View, as this will allow you to see your pages as they will look when printed. Click the View tab, and then click the Print Layout button (far left on the toolbar). Click the Home tab, and if it is not turned on, click the Show/Hide button . This will enable you to see page and section breaks, the spacing on your page, and other hidden elements not usually visible. In the example below you can see a page with Show/Hide turned on. Note the backwards “P”, and the page break in the example. When Show/Hide is turned off, these will not be visible. Save your Word document, but don’t close it. You are going to set up your page size, margins, etc., according to the details on your Design Checklist. You are going to insert the section breaks for the different sections (chapters) of your book. NOTE: If you have your book (manuscript) as one big Word file, first spend the time to decide what your chapters and parts (if required) are. This is important, as you will actually start inserting your headers and footers from the back of your book. You are going to insert the Headers and Footers in the different sections. The first setting you need to do is the page size. This is according to the book size you choose. In Word this is done using the Page Setup option. It’s always practical to use standard book (paper) sizes for your book – this will save on costs when printing offline. If the printer needs to use non-standard paper sizes they will charge extra. If you’re going to sell your book through any of the online publishers, you will be able to get the standard book sizes on their site. Are you ready to get started on your book design? For example purposes, we are going use a 6” x 9” book size. Our example will have 5 chapters. 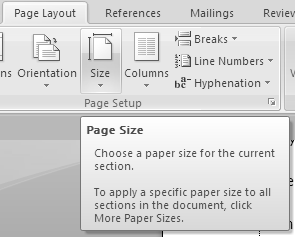 With your new document open, click the Page Layout tab on the menu bar, then click and open the Size option. On the drop-down menu, click More Paper Sizes (at the bottom of the menu). The Page Setup window will display. The Paper option should be displaying, and if not, click the Paper tab (see above). Open the Paper Size drop-down menu, and choose your paper size. Usually the paper size you need won’t be listed here (e.g. A4, A5, etc. are the standard sizes available in Word). 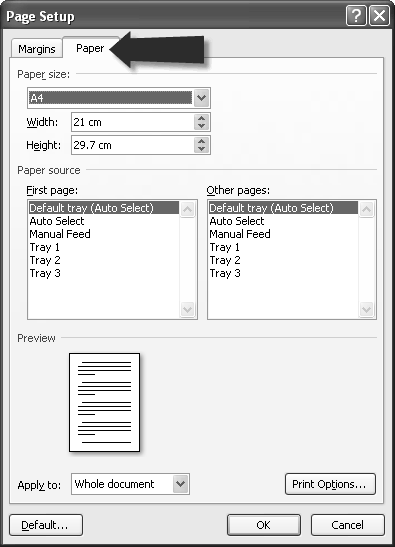 On the Paper size drop-down menu, choose Custom size (last option). After choosing the Custom size, you then need to enter the Width and Height sizes in the respective fields. Example: Using our example book the size is 6” x 9” inches, the width will be 15.24 cm (152.4 mm), and the height will be 22.86 cm (228.6 mm). NOTE: If the units of measurement in Word are set to inches, then you will enter “6” for the width, and “9” for the height. Check that the Apply to (bottom left corner of window) drop-down menu is set to Whole document. When you are done, you can proceed to the next setting (Layout), or you can click OK. If you click OK, your Word page will display as the new 6” x 9” page size. It will look a little weird, as the margins haven’t been set correctly yet. In the next post, I’ll cover Layout and Margins. Wow, thank you very much, Nicole.